She utilized a clear and consistent information hierarchy by separating the label into two halves separated by a line. Name , Dose and Instructions are above the line. 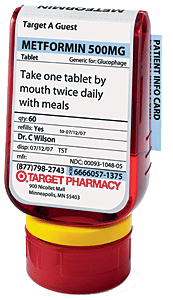 Required but less important info (qty, expiration date, Doctor, Pharmacy phone number) are below the line in smaller type. Color coded rubber rings attached to the neck of the bottle ensure that, just like with a communal electric toothbrush, you never put something in your mouth which was intended for somebody else in your family. Deborah shopped her design, but it was quickly snagged up by Target, who bought the IP and rolled the concept out across their chain. The concept is consistent with Target’s overall brand image and has been an unqualified success. You can learn more about the design and innovation process for ClearRX at Peter Merholz’s Experience Matters blog and in the article “The Perfect Prescription” from New York Magazine. Personally, I find it to be a great example of how a dominant industry format can be re-engineered from the bottom up by thinking thoughtfully about the way users interact with the product and trying to streamline and improve the user experience via human factors study. Just because a design format is time tested and well entrenched, it doesn’t mean it is immune to innovation.